The young female will grow up to an impressive height of 8ft (2.5m) and weigh over three quarters of a tonne. Peter Smith, Chief Executive of the Wildwood Trust charity, said yesterday. "It's great to see these majestic beast roaming in Wildwood after a break in the UK of over 3000 years. They are joining our wolves, bison, wild boar, beavers and lynx helping to complete the wildwood collection, eventually representing all of our formally native species." "Our mission is larger than teaching visitors and school children about our amazing natural heritage; we are working on restoring some of these animals to the wild. Our charitable vision is to rewild Britain and create natural landscapes, brim full of wildlife for our future generation, and in the process save taxpayers millions in tax breaks and subsidies." 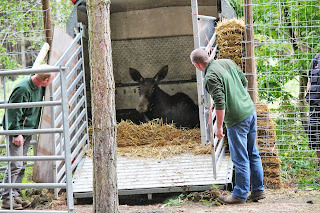 "Rewilding works by having large formally native animals on nature reserves, their grazing, munching and digging then create the conditions for a cascade of other wildlife to share the habitat with them. Animals like the elk and beaver hold the key to saving species such as the rare water vole which have, in reports last week, suffered a further catastrophic decline in numbers. Beavers and elk help create rich riverbank and wetland habitat that serve as an ideal habitat for water voles as well as a range of threatened fish, insect, birds and plants." 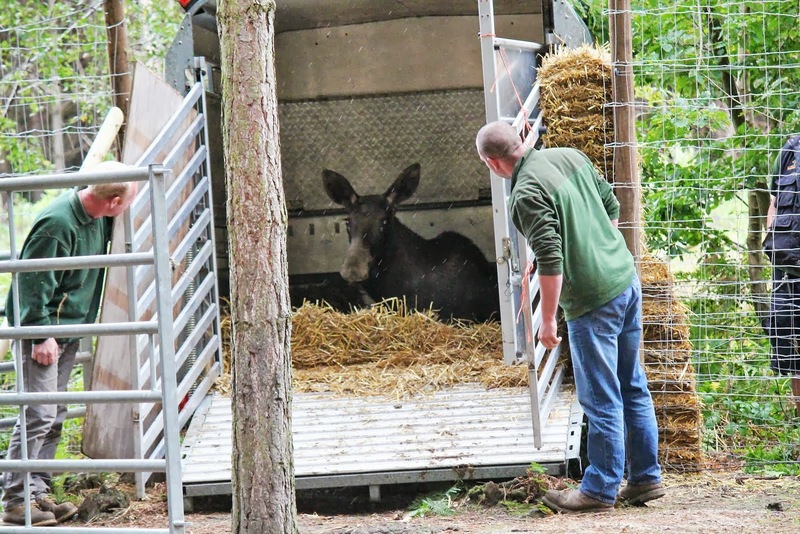 "While we have no plans as yet to reintroduce the elk to the wild, as they are potentially dangerous to humans, we are working on major projects to restore beaver to the UK, and hope one day top create the space for Britain to once again have elk in the wild." She will be joined by a young bull Elk next week and it is hoped that romance will blossom and continue the line of these wonderful animals. Elk are immensely strong but visitors can see her protected by special 10ft electric fence. Elk are just one of the many animals of Britain's past and present that can be seen at the award winning Canterbury based charity. Wildwood is an ideal day out for all the family where you can experience the amazing world of British Wildlife and its conservation. Wildwood offers its members and visitors a truly inspirational way to learn about the natural history of Britain by actually seeing the wildlife that once lived here, like the wolf, beaver, red squirrel, wild boar and many more. Wildwood is situated close to Canterbury, just off the A291 between Herne Bay and Canterbury. For more information visit our website at www.wildwoodtrust.org or telephone 01227 712 111. 4. They can run at over 35 miles per hour, but prefer jogging at around 6mph. 7. Despite their size elk often fall prey to wolves and bears. But it was man that nearly hunted these animals to extinction. Elk, along with many other wild animals, are now retuning from Eastern Europe and have been sighted living wild in Germany. Wildwood is getting ready to face a Saxon invasion this weekend when Regia Anglorum, one of Britain's best Saxon re-enactment groups will be at the park on the 14th & 15th of September for their annual Saxon re-enactment weekend. Visitors will be able to step back in time and visit Wychurst, the group's authentic Saxon Burgh (village) nestled in the depths of the forest at Wildwood and experience how our Saxon ancestors lived circa 1000AD. Wychurst - literally meaning "the village in the wood" - is a Saxon Manorial Burgh, reconstructed by Regia Anglorum according to the best available evidence. The group have spared no trouble or expense to ensure that the site and its environs are as close to the original as possible. The Burgh features a spectacular Longhall along with other buildings and is exactly the kind of place to which local people would have retreated when the Vikings sacked the city of Canterbury over a thousand years ago. For visitors that came to the site in June, you will find a lot of changes, including, newly erected front gates, increased wall paintings, more work on the amazing embroidery, in fact the only thing that hasn't changed is the determination of the Saxons to defy the invaders! The site will be open to visitors from on 14th & 15th September from 10.00am to 4.30pm. There is no need to book, come along at any time. Entry to Wychurst will be £3.00 for 14yrs and over (under 14yrs free). All under 18's must be accompanied by a responsible adult at all times. Wildwood entry fees or membership must also be paid to be allowed access to the event. Learn how to identify spiders and understand their role in the ecosystem. Time will be spent out in the field finding spiders in their natural habitats and discussing their conservation. Discover the secret lives of our tiny eight legged neighbours in our 2-part spider day. Go on a spider hunt through the woods in the morning and then spend the afternoon making spider crafts with our Natural Heritage Officer, Steve Kirk. 11am - 4pm. £3 per person*, one adult free per family. 10am - 4pm. £79 per person. Min age 18yrs. Give the animals that live in your garden a helping hand over the winter with our family craft event. Make small animal homes, shelters and feeders to take home and learn about the wildlife that might be hiding in your garden. 2pm - 3.30pm. £3 per person*, one adult free per family. 9.30am – 4.30pm. £30 per person. Book together with Kent Mammal ID Course (23rd Nov or 1st Feb) for £50. 10.30am - 4pm. £35 per person (£50 when booked with Wolves 2 on Oct 27). Min age 12yrs. 10.30am - 1pm or 2pm - 4.30pm. £3 per person*. Min age 7yrs. 2pm - 3.30pm. Costumes judged at 3pm. £2 per person*, one adult free per group. 2pm - 3.30pm daily. £3 per person*, one adult free per group. 9am - 4pm. £79 per person. Min age 18yrs. Must book. spiders, rats and witches to decorate your home for Hallowe'en! 10.30am - 12pm or 2pm - 3.30pm daily. £3 per person*, one adult free per group. 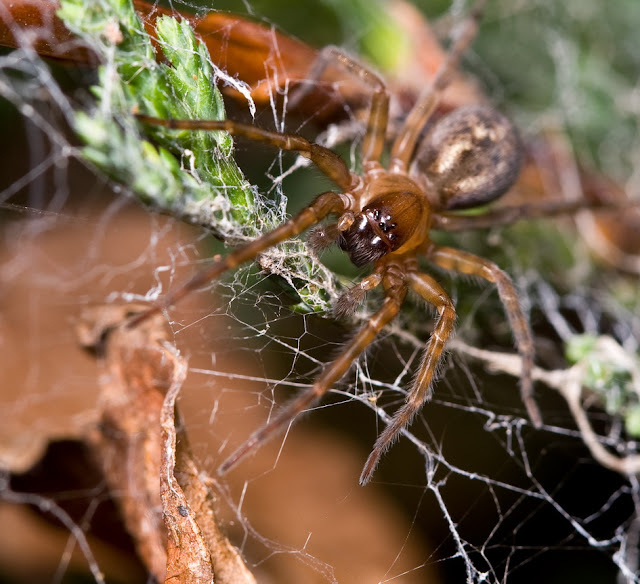 Learn how to identify British spiders and understand their role in the ecosystem. Discover how to assign spiders to families and find out about Britain’s most venomous genera. Collect your own live specimens in the field using an innovative technique and observe them under the microscope back in the classroom. Time will also be spent learning about web morphology. The course is run by our expert field biologist, Steve Kirk. or visit the conservation courses page on our website.